How different patterns in terms of jobs creation have affected economic growth, the distribution of income and poverty reduction? How is the technological progress influencing structural change in different countries, its impact on jobs, wages and inequalities that arise? What types of public policies/institutions and/or external shocks are behind these different structural transformations? How do labour regulations, their enforcement and the way they interact with the ongoing structural changes affect quantity and quality of jobs? What is the interaction between demographic change, structural transformation and economic growth? What are the factors driving female employment and wage gaps? How are jobs being created in the context of fragility? We welcome submissions of papers around topics related to labour economics in the context of emerging and developing countries. 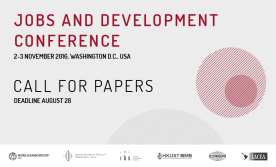 Papers focusing on assessing the consequences of structural transformations, technological progress, demographic change in the patterns of jobs creation on economic growth and social development in developing and emerging countries, including the different way it impacts men and women, are encouraged. NOTE: We require a specific naming convention for the paper-- “Name of Author_Paper Title”. Only one submission per person is accepted. The scientific committee will review all papers and make a decision by September 16. Full papers will be given priority; detailed abstracts will also be considered, but on a secondary basis. Authors of selected papers will be contacted immediately to allow for arrangements to present the paper at the conference. Details will be provided at that time.